The Halton Wentworth Emergency Veterinary Clinic is open from 6pm to 8am each evening and open weekends and holidays. 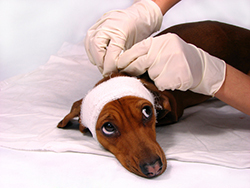 If your pet is in need of emergency care please contact them at (905) 529-1004. Their address is 505 King St W, Hamilton ON. They are between Margaret Street and Lock Street.